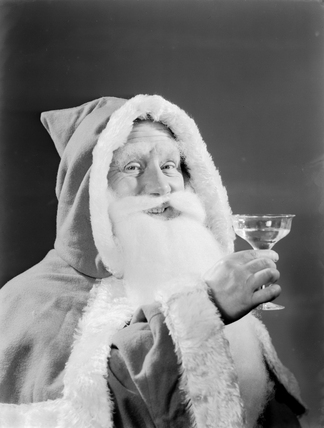 A photograph of Father Christmas drinking a toast, taken by Photographic Advertising Limited in 1950. This image was sold for use in a Co-op staff magazine. Christmas is a popular subject in the Photographic Advertising Limited archive, suggesting joy, goodwill - and overspending. Photographic Advertising Limited was founded in 1926 by a group experienced in photojournalism and film. The company created multi-purpose stock images with the potential for selling a range of products. Whilst enjoying its greatest success during the 1930s, it continued in business until 1977. Photographic Advertising Limited's trademark, the staged studio photograph resembling a film still, was its selling point and, later, its downfall. Sophisticated, adaptable and generic, this kind of image gradually fell out of favour as clients increasingly demanded targeted advertising campaigns with specific photographs. Woman carrying Christmas presents and tree, 1947. Woman and two children carrying Christmas presents, c 1948. Woman and girl decorating a Christmas tree, c 1948. Woman and two children looking at a Christmas tree, c 1948. Woman giving Christmas presents to children, c 1948. Woman carrying armful of Christmas presents, c 1950. Young girl carrying an armful of Christmas presents, c 1950.